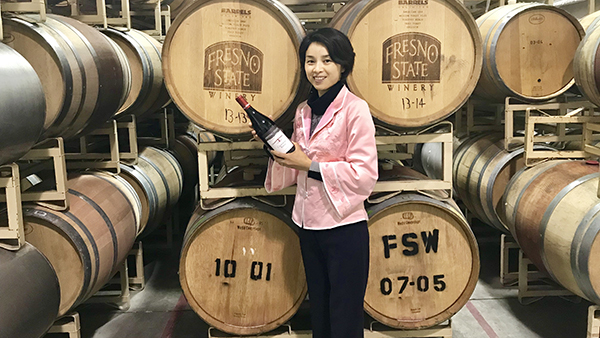 Kristy Sun is an assistant professor of enology who enjoys working with students and seeing them grow professionally. Kristy started at Fresno State in August 2017. She received her Ph.D. from Cornell University with a focus on wine chemistry. After graduation, she worked in the food industry as a scientist for about four years. "I am teaching students the science behind wine making," she said. "I get excited when their eyes light up as they understand a concept, and when they see the connection between what they are learning and their future career." Since joining Fresno State, Kristy has developed several research projects involving students that will benefit the San Joaquin Valley grape and wine industry. "I will continue to build a positive learning environment for students," she said. Kristy added that she found it fulfilling to learn that some of her students have received scholarships and have been accepted into top-notch graduate schools as a result of the education they receive here at Fresno State. "Enology is where science meets with art," she said. "I love exploring how scientific knowledge can improve wine quality and sensory perception, which could have a positive impact on the wine industry and local economy." Kristy is involved in several committees that serve the University, her college and department. She is a faculty adviser for the Enology Society student club. "I am working with students to promote the education of wine through organoleptic evaluation, lecturers and tours," she said. "This spring semester, we are inviting winemakers across California to present their wines and discuss their winemaking styles. All of that could benefit our students and community." Kristy is married; her husband is a food safety/microbiology scientist working in the industry. "We met when we were 18 years old and attending the same college in China," she said. "We both graduated with a Ph.D. from Cornell University." Kristy's hobbies include reading, cooking for family and friends and watching movies with her kids. She has two daughters, Alice, 6, and Charlotte, 3. "Both of them like music and dancing," she said. "I am a big fan of them."